KPMG, a primary cooperate sponsor for MES, took part in environmental conservation projects with two of our member resorts, Castaway Island Resort and Likuliku Lagoon Resort, as part of their social responsibility. 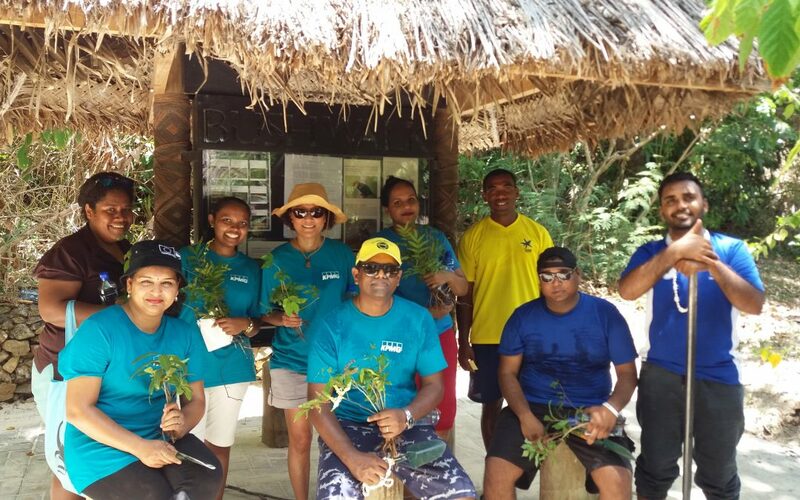 Twenty KPMG staff got involved with allocated environment projects at the two resorts Castaway Island Resort hosted a group who participated in dry forest seedling sourcing from the pristine forest ecosystem at Qalito island. Qalito Island is one of the remaining islands in the Mamanucas still intact with native dry forest species. The hardworking lads assisted in potting dry forest seedlings they were growing in abundance in the wild-ridge areas. A collaborative partnership was established with the local communities and MES members to assist islands with degraded dry forest areas. The main aim of the activity is to source and monitor these endangered dry forest species for the nearby villagers Yaro and Solevu to be replanted in the grassland and bare hills of Malolo Levu island. The team also took part in a coral planting activity in support of the Outriggers OZONE conservation initiative to grow a football field worth of corals. “It was an absolute pleasure learning about the excellent efforts the resorts, and MES is taking to recuperate the natural resources through tree planting, coral planting and protecting the endangered crested iguana species, said Mr Sharvek Naidu. At Likuliku Lagoon resort, the team also assisted in the dry forest restoration and monitoring of the endemic crested iguanas. The participants were briefed on the dry forest history in the Mamanuca’s and current work in Fiji. With the assistance of the resort Environment Manager, Mr Sialisi Rasalato, he highlighted the relationship between the endemic Fijian Crested Iguana with the dry forest as their habitat and source of food for them. The group also took part in coral planting to help restore the in-house reef ecosystem. The days ended with snorkelling along the in-house reef and exploration of the marine life that inhabits the surrounding fringing reefs. MES wishes to thank KPMG for taking part in the program and the continuous support from Castaway Island Resort and Likuliku Lagoon Resort for hosting the group.